This is a nice short article covering the calculation of inductances for coils wound on cores and wire sizes. The author recognized that standard formulas, although concise and accurate, are sometimes difficult to work with when calculations for a large number of values is needed for a particular circuit design. To address the situation, he presents a handy nomograph, chart, and a table of typical values. 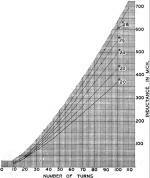 A smartphone app, a spreadsheet, or a desktop computer program would be used today to calculate inductance values, number of turns, winding spacing, etc., but back when mechanical slide rules were the order of the day, these visual methods were a real benefit. 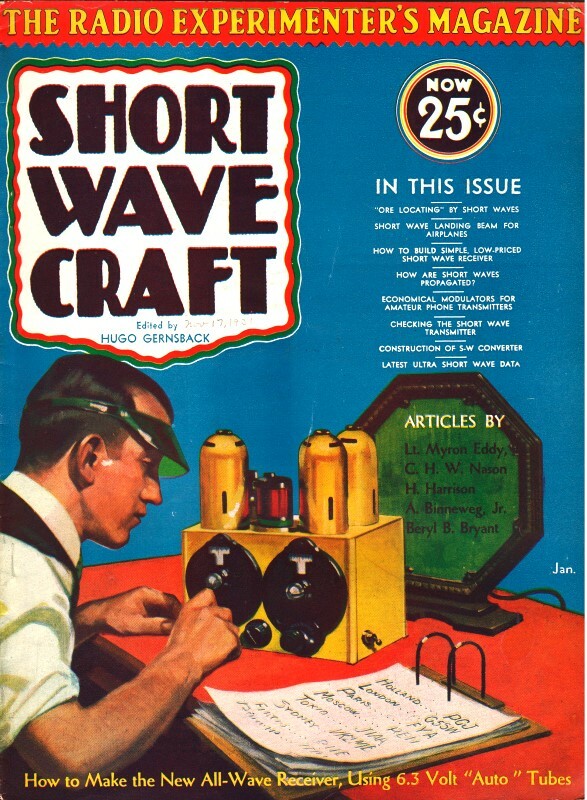 By James K. Clapp*Every radio student should know how to calculate the inductance of a coil of given or known size. Here's a simplified method worked out by a leading engineer. Fig. 3 - The graph at left gives the values of Nagaoka's constant "K" for' different values of 2a over b = dn0 over n, on a logarithmic scale. 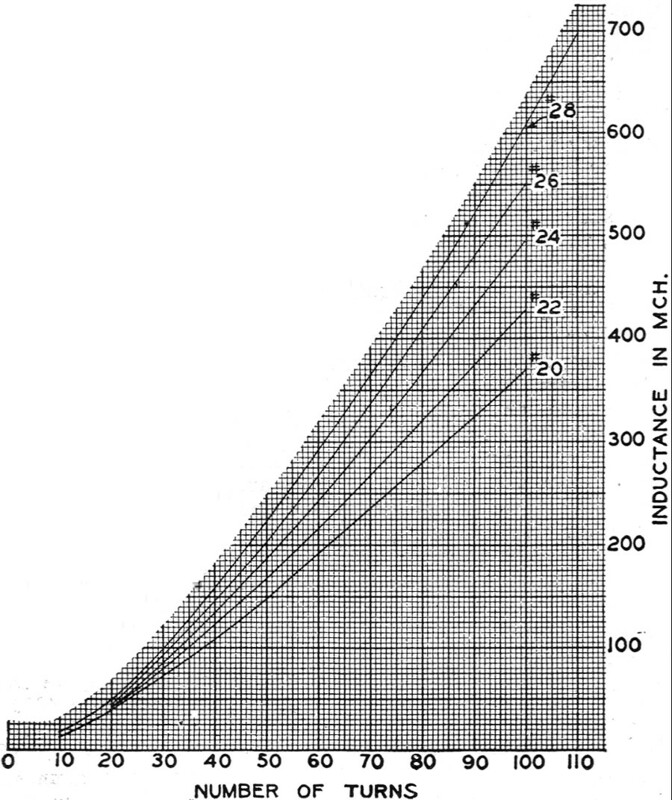 This chart will prove very useful in calculating the inductance of coils. While much material has been published on the calculation of the inductance of coils.† the formulae given are in general not convenient for engineering use. Two difficulties are encountered in applying the results in engineering practice, one being the involved computations and the other the fact that differences in form and wire sizes and errors in the measurement of these factors introduce errors in the calculations which largely vitiate the utility of precise formulae. Fig. 1 - The inductance of coils closely wound on General Radio, type 577 form, as a function of the number of turns and different sizes of double-silk covered wire. Table I gives number of turns. For single-layer coils at radio frequencies (and, with slight modification, for bank-wound coils), Nagaoka's formula probably is the best for general engineering use. While neglecting the shape and size of the cross-section of the wire, the self-capacity of the winding and the variation of inductance due to skin-effect, it may be shown that the formula gives about as good results for high-frequency inductance as can be obtained. Tables of the values of Nagaoka's correction factor have been prepared, but require considerable time to use due to the necessity for interpolations. The table values may be plotted in the form of a curve, but a more convenient interpolation is made possible by plotting these values on logarithmic scales, as has been done in Figure 3. Where much work of this type is done, the scales may be transferred to a slide-rule so that no reference to printed material is required. The formulae given here, when carefully applied, give values of inductance to within about two per cent. for single-layer coils and to within about five per cent. for four-layer bank-wound coils for frequencies where the coils would serve as normal tuned-circuit elements. where a is radius of a mean turn in inches, n is the number of turns, b is the length of the winding in inches, and K is Nagaoka's correction factor which is a function of or the ratio of diameter to length of the winding. and d is the diameter of the mean turn in inches. Given the size of wire and its insulation and the diameter of the coil form, n0 as wound, is found from Table I and is readily computed for any desired number of turns. Read the corresponding value of K from the scales at the left. The inductance is then easily computed by means of the slide-rule. For banked windings of not too great depth as compared with the diameter, a close approximation for the inductance is obtained by using Nn0 for the turns per inch (where N is the number of banks) and for the ratio of diameter to length. Fig. 2 - Inductance of coils wound on General Radio, type 577 form, with double silk covered, copper wire, in which the turns have been equally spaced in order to fill the 2-inch winding space. Here n0 = 1/2 n.
Given: Form diameter = 2.75 inches (General Radio Company Type 577 Form). Wire size = No. 20 double-silk-covered. Find: The inductance for coil of 35 turns. L = 0.0251 x (2.79)2 x 35 x 25 x 0.526 = 90.0 microhenrys. For a rough estimate, the diameter of the form may often be taken as the diameter of a turn. In the above example this procedure gives = 1.965, K = 0.530 and L = 88 microhenrys, which differs from the previous value by about 2.5 per cent. Then 4 x 25 x 200 x 0.604 = 2570 microhenries. Many experimenters and many engineers "design" inductors by guessing at the number of turns, then peeling off wire until the correct value of inductance is obtained rather than go to the trouble of using the usual tables and formulas. Our experience with the method described here proves conclusively that much time and effort are saved by calculating the desired value of inductance before the coil is wound. - Courtesy "General Radio Experimenter." †See in particular the publications of the U. S. Bureau of Standards and the Proceedings of the Institute of Radio Engineers.